Bruce covered the song 11 times. Most of the time he performed the song in the Stone Pony during school benefits. The second year of the private Rumson Country Day School benefits with Bruce, Patti Scialfa, Jon Bon Jovi, Southside Johnny and Bobby Bandiera (is is not known who played on what songs). Admission was once again, as last year (April 13 and 14, 2002) restricted to Rumson County Day School parents. Holiday Shows. Bruce Springsteen & Friends performing two shows; one at 4:30pm and another at 8:30pm. Patti Scialfa shares lead vocals for "Tell Him". The fourth annual Rumson Country Day School benefit concert. The band consisted of Bruce Springsteen, Bobby Bandiera, Joey Stann, Muddy Shews, Joe Bellia, Kevin Kavanaugh, Ed Manion and Chris Anderson. Private benefit for parents and teachers of the Ranney School of Tinton Falls, NJ with Bobby Bandiera's band (plus saxophonist Ed Manion on several songs) backing Bruce. Annual benefit for the Ranney School for teachers and parents, backed by Bobby Bandiera and his band. Southside Johnny and Patti Scialfa take lead vocals on several songs each. A benefit for Bruce’s son’s school. Bruce is backed by Bobby Bandiera’s band. Patti Scialfa and Southside Johnny each take lead vocals on several numbers. Benefit for the Ranney School. 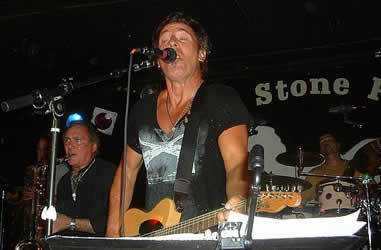 Bruce is backed by Bobby Bandiera’s band and is joined by Patti Scialfa and Southside Johnny. Bruce and Patti perform with Bobby Bandiera's band at the wedding of Kelly Kilbride and Ryan O'Toole at a private estate in Oakland, NJ. Kelly is Patti's personal assistant. Bruce sang lead and played guitar on several classics, while Patti took lead vocal duties for "Tell Him"
"Tell Him," originally written and composed as "Tell Her," is a 1962 song that was written and composed by Bert Berns, who, when he did so, used the pen name of Bert Russell. The song was first recorded as "Tell Her" in 1962 by Gil Hamilton, aka Johnny Thunder, with Berns producing. The song is best known by the version of the the Exciters. Ennio Morricone used the same orchestral intro for Italian singer-songwriter Gianni Meccia's song "Il pupazzo"/"The Puppet."